My life has been so busy this last week that I've only had the time and energy to create simple little things. (Not that I ever create large complex things, but you know what I mean.) 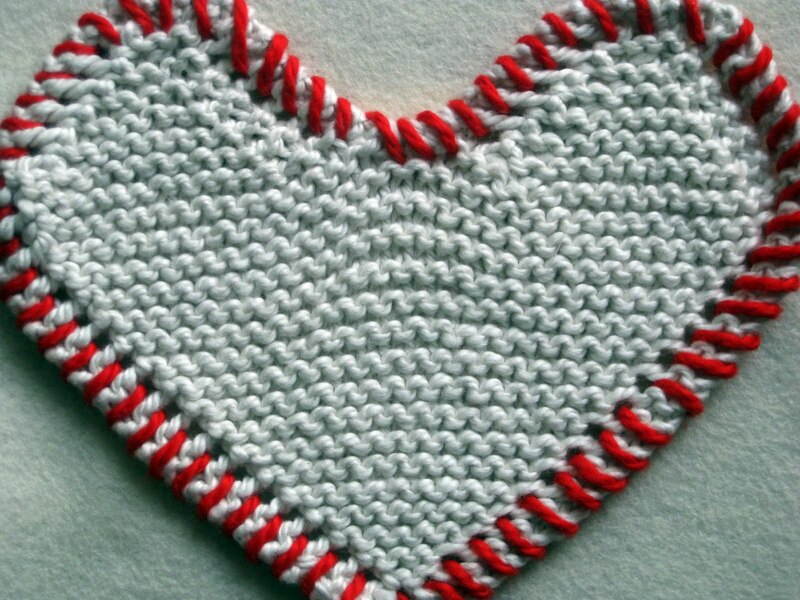 I must say I adore this knit heart. It sits on my coffee table and serves as a coaster/place mat/doily. After seeing what the Hana Ami Flower Loom can do over at The Purl Bee, I had to get one. The Michael's near me had them in stock, but when I got to the counter I discovered my 40% off coupon wasn't good until the following Sunday. Aaargh. I had to wait three whole days, and every morning when I woke up my first thought was "I'm just going to go and buy it." 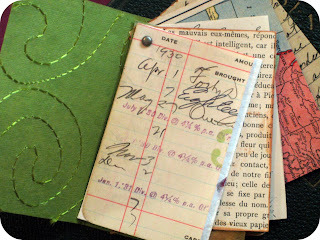 But somehow I held out and finally bought it yesterday, and I did feel a bit warm and fuzzy about saving eight bucks. I've only had a couple hours to play with it and look forward to learning about all of the different possibilities. The rest of this week is looking busy with lots going on at work, so I'm going to take a break until Saturday. 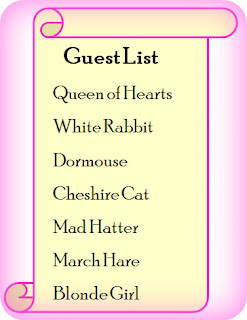 I hope you will join me then for the Mad Tea Party. Things are super busy this week with a huge project for work that's due tomorrow. 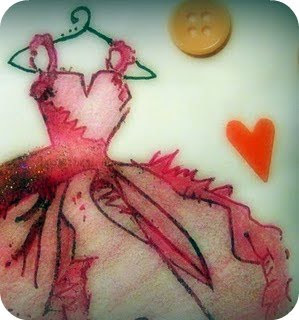 It's unfortunate because I'm feeling extra crafty and have little time for making stuff. 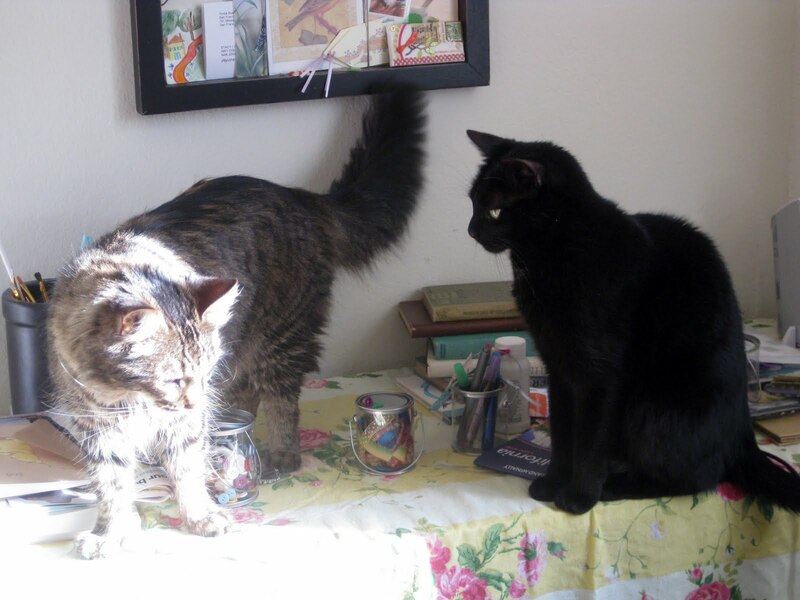 Plus there are furry monsters squatting in my creative space. 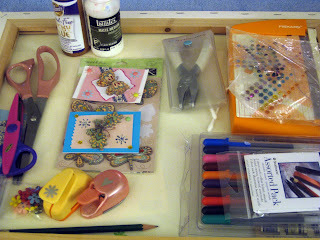 So I made a portable art studio for working in front of the teevee late at night while watching season two of True Blood on DVD. Season three started last Sunday ... yipee! 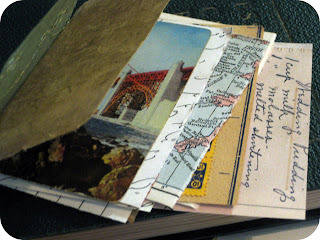 I've been making greeting cards using the vintage ephemera I picked up recently at an antique store. 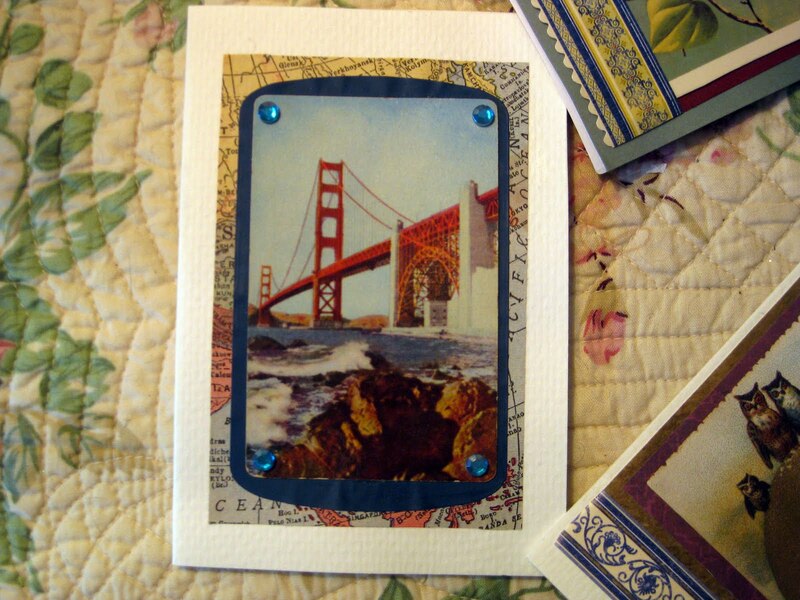 The image of the Golden Gate Bridge is the back of an old playing card. 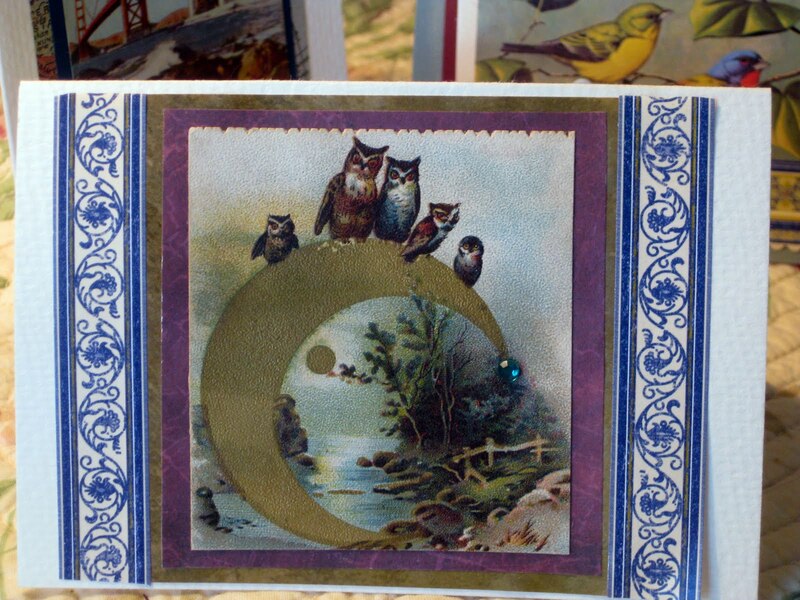 I like using the actual vintage item rather than making color copies because it gives the card more texture and more character. 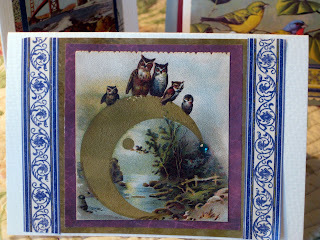 Those who know me know that I love, love, love owls. 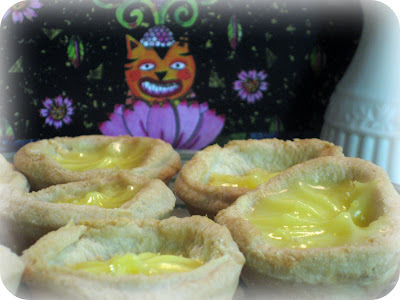 I have a few more projects I'm working on but they aren't ready to see the light of day. Hopefully this weekend I'll have time to finish up a few things. We are taking my dad hiking for Father's Day on Sunday, but other than that the weekend is (hopefully) mine. 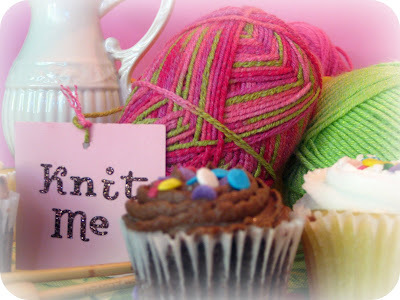 The situation: An enormous stash of yarn and general boredom with knitting. The challenge: To knit with a color that I don't particularly like, a color that makes me uncomfortable. 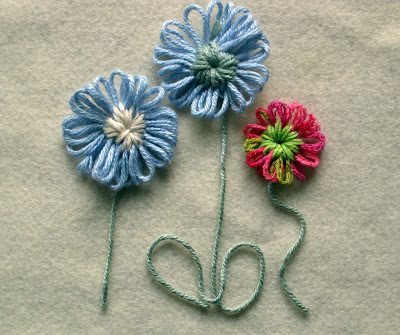 The purpose: To renew my enthusiasm and breath fresh life in to my knitting practice by trying something different. 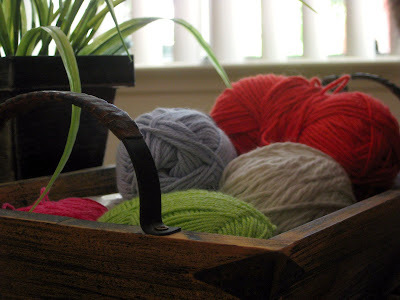 The added benefit: Using up yarn in my stash that might otherwise languish for years. 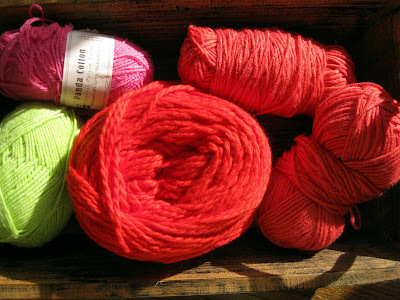 The choices: An array of yarn in colors that I normally wouldn't touch, purchased long ago for reasons now forgotten. 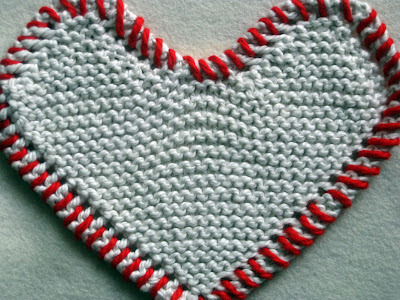 The outcome: A diagonal dish cloth that, to my surprise, I enjoyed knitting very much. 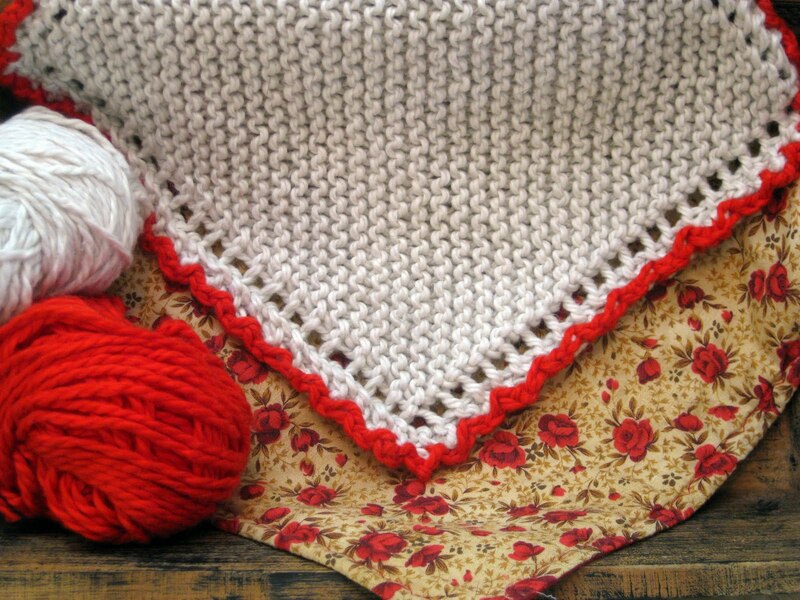 The unexpected benefit: So much enjoyment knitting the first one that I created a second, smaller cloth in white with a red crocheted border. The next challenge: Knitting an item from a new pattern that I have never tried before. 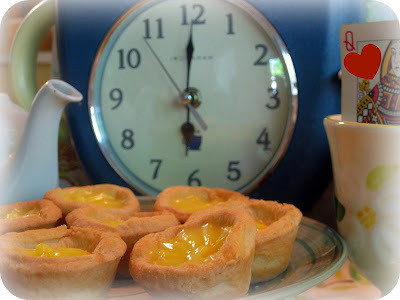 I spent some time last weekend creating art for the Mad Tea Party on June 26th and scribbling down ideas for my post on that day. It's been so long since I read Alice in Wonderland that I had to google "mad hatter" and "march hare" to refresh my memory. 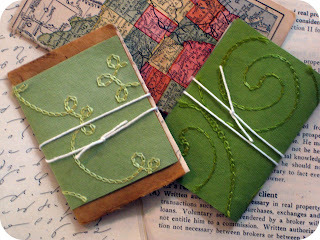 These are little books I made with handmade paper and antique maps, savings passbook pages, playing cards, and more. 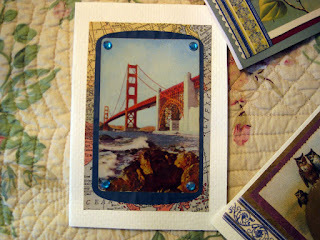 They are 3.5 x 2.5", the same size as an artist trading card (ATC). 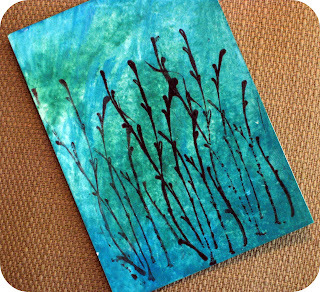 This is my June ATC for my swap group-- the theme is "ocean." 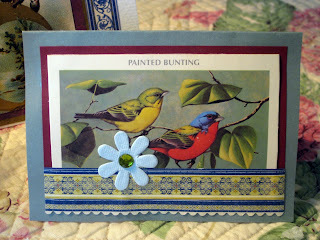 I wanted to do something different this month, so I used watercolor paints for the background and stamped the reeds. It is titled "Under the Sea." 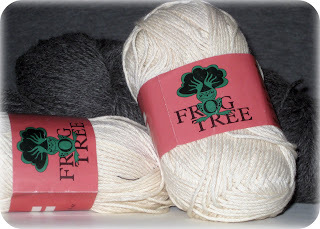 This pima/silk Frog Tree yarn is the latest addition to my out-of-control stash. I couldn't resist buying it when I was in Mendocino last month because I love that little village so much and yarn is the perfect souvenir. Sometimes I think I like buying yarn more than I like knitting with it. The big gray hunk in the background is 650 yards of alpaca I bought from my sister. 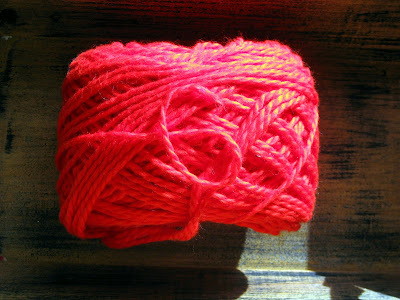 Some day I hope to make a lacy shawl with it. 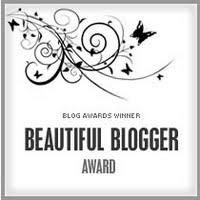 Thank you to Debbie at Strings of Purls for awarding me the Beautiful Blogger Award! I will have to share ten things about myself soon. 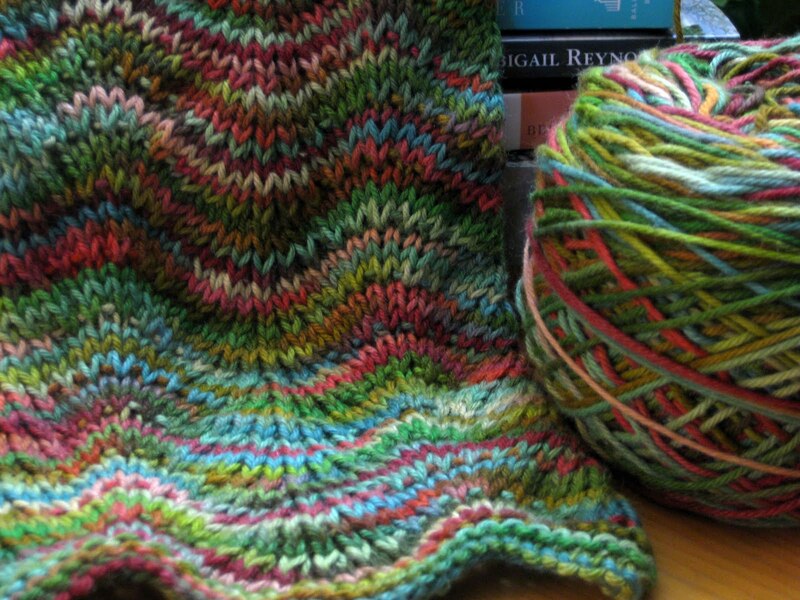 My knitting has slowed down considerably since the weather warmed up. 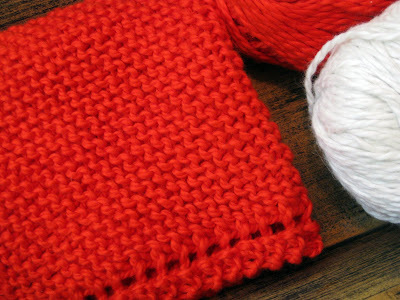 One item on the needles is this Apple Tree Scarf (link to Ravelry). It is knit in a chevron pattern, and I've been thinking about frogging it because the sides curl too much, in spite of the selvage stitches. But I'm going to think about it some more before I do anything drastic. 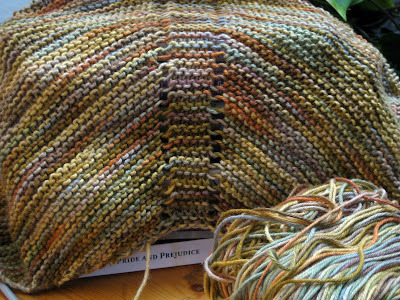 Still working on my Multnomah shawl (another Ravelry link). I'm up to 200 stitches and almost ready to start working on the lace section. It's an enjoyable pattern. This is the best I could do for a photo because it's all scrunched up on circular needles. I wish you could see how pretty the colors actually are. 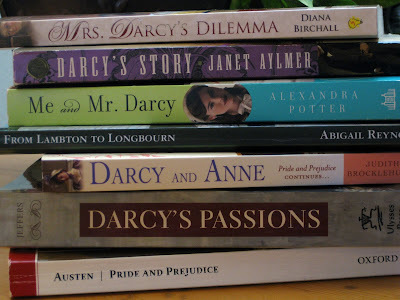 I'm having a great time reading Pride & Prejudice sequels and adaptations. There are SO many out there, and they range from extremely dull to extremely raunchy. One of my favorites so far is Suspense & Sensibility by Carrie Bebris. It is the second in a series of Regency mystery novels featuring the Darcy's, and this one in particular also has characters from Sense & Sensibility. (It also has a supernatural element, so if that is not your bag you might not like the first couple of books in the series.) I picked up three more in the series at the library this evening and can't wait to read them this weekend. 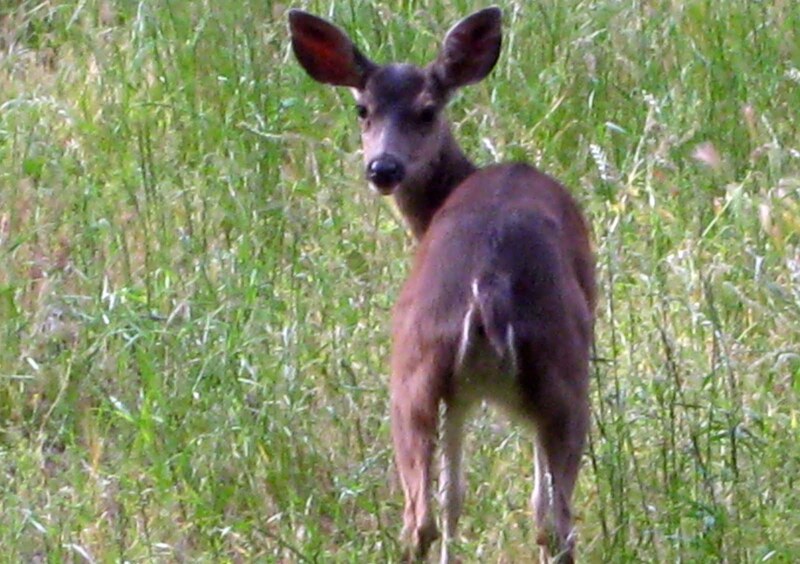 On Monday I got out and hiked in the hills near my home. It felt so good! I had to move very slowly because I'm not used to walking uphill anymore, but it was easier than expected. There were a few quail out and about, along with lots of little brown birds that I couldn't identify. I thought I heard an owl hooting in a small valley, but it might have been kids playing around and I was too tired to go up an incline to check it out. 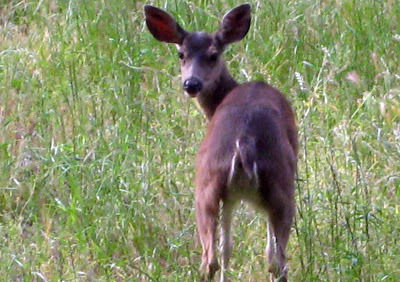 This deer greeted me at the end of the hike. I'm hoping to go back this weekend if it isn't too hot. What are your weekend plans? I would love to know.